It is usually a general rule that if your team plays mistake-free football, then your team normally wins. In Sunday’s game pitting the visiting Carolina Panthers and Arizona Cardinals, the Panthers did what they have not done all season – play turnover-free football. And Jake Delhomme wasn’t a major factor, either. 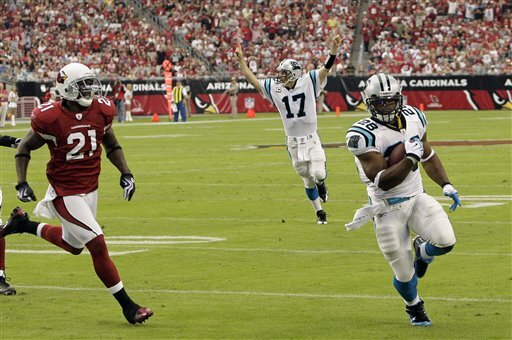 Actually, the running attack, along with some timely defense made things easy for Delhomme and Co. as Carolina easily handled Arizona 34-21 at University of Phoenix Stadium. Cardinals quarterback Kurt Warner didn’t exactly have a stellar day as he was harrassed by Panthers defensive end Julius Peppers; he simply didn’t have the protection to be successful as he turned the ball over 6 times – one on a fumble and 5 via interception. The first quarter was played evenly enough as both teams scored a tocuhdown – Carolina on a 6-yard touchdown run while Arizona got on the board via a 14-yard pass from Warner to Larod Stephens-Howling, evening things up at 7-all going nito the second quarter. 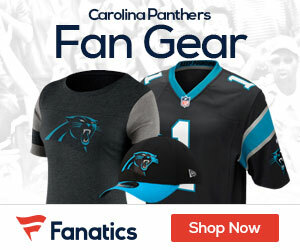 The second period was all Panthers as Stewart would score again on a 13-yard dash into the end zone, along with a 50-yard Delhomme-to-Steve Smith TD pass and an interception by Peppers, which was taken back 13 yards for a score. When the carnage ended, the Panthers were up 28-7 with 7:28 remaining in the first half; that score would stand as both teams went into halftime. Arizona would strike back on a 1-yard Warner-to-Ben Patrick TD pass, narrowing their deficit to 28-14; however, two field goals by Panthers kicker John Kasay – one from 35 yards and one from 31 yards – would ensure the victory for Carolina. Delhomme, as previously stated, didn’t factor much into the decision as he went 7-of-14 for 90 yards and a TD; on a related note, he left the game with a chest injury after the TD pass. Warner had arguably his worst game this season, going 27-of-46 for 242 yards with 2 TD’s but 5 interceptions. DeAngelo Williams and Stewart combined for 245 rushing yards – 158 for Williams and 87 plus two scores for Stewart; Beanie Wells led all Arizona rushers with 47 yards while Tim Hightower added 39 rushing yards and caught 8 passes for 57 yards. Steve Smith led all Carolina receivers with 56 yards on 3 receptions; Larry Fitzgerald led Arizona with 6 receptions for 66 yards while Steve Breaston caught 6 passes for 57 yards. Carolina (3-4) plays again next Sunday when they travel to The Big Easy to take on the New Orleans Saints while Arizona (4-3) jets to Chicago to face the Bears – also on Sunday.